We offer a variety of classes open to the public in the South London area. 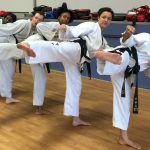 The aim of this award syllabus is to keep junior students focussed and motivated, as they progress through the official ITF Taekwon-Do grading programme. 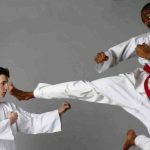 There are ten grades from white belt (beginner level) to black belt (proficiency). Students advance to the next grade by taking a formal grading examination. Junior students can take anything from five to twelve years to achieve black belt, depending on attendance, age and skill level. To keep juniors motivated between grades, unique badge awards can be achieved by attending an assessment. It is possible for a student to achieve all badges at one assessment. However, junior students can take on average three assessments to achieve all badges. When all badges have been attained, juniors are promoted to the next grade. Students are promoted to Green Tag (7th Kup) when all of the following 11 badges (sections) have been achieved. 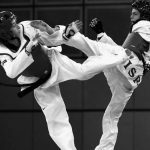 Before taking part in the Yellow Belt assessment, students should have attended a minimum of twelve sessions and a minimum of three months of training. See below video playlist of the syllabus. What does the colour of a yellow belt signify? : Yellow signifies the Earth from which a plant sprouts, as the foundation (root) for Taekwon- Do is being laid.